Provide comfort for the family of Andrew Chapman with a meaningful gesture of sympathy. 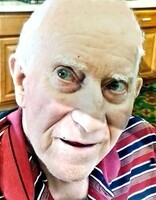 Andrew J Chapman was 2 weeks short of 90 years old when he passed in his sleep at around 6:30 AM on April 4, 2019. He was usually known by family and friends as Andy. Andrew was married to his wife Thelma D (Slater) on July 2, 1949 for a total of 69 years. After his marriage to Thelma, they settled in Syracuse, NY where Andy worked at GE. In 1950 they had their only son, David and in 1952 me, their only daughter Patricia. After I was born they moved to Hammond, NY where he had his own TV and appliance repair company. Later he quit TV and appliance repair and started his own paving company called Nelson Company Paving. In 1962, he started taking us to Sebring, FL for the winters as snowbirds where he also ran his Paving business. Around 1968-1969, he was able to build a dam and make a beautiful lake near Rossie, NY. A long the way, he enjoyed being a private airplane pilot and going garage sale hunting. Also, in his later years, he had a gold and silver business. While growing up, I remember how much he liked to entertain with his card and coin magic tricks. He also enjoyed singing and playing a variety of musical instruments by ear. His favorites were a guitar, harmonica and the piano. He was also a licensed Amateur Radio Operator (Ham) and enjoyed many hours chatting with people around the country and sometimes the world. As a child, the one memory when I felt he was a magician was how he made me believe he could move the moon from one side of the car to the other. Dad would always say close your eyes and don’t peak and I’ll move the moon. It took a while to figure out he was doing this by simply going around a curve in the road. I never did figure out most of his card tricks except one and that was because I just happened to be standing behind him while he was performing it for someone else. He didn’t know I was there and I saw how he pulled it off. Dad was preceded by his wife, Thelma D (Slater) Chapman; his only son, David Andrew Chapman; his father, Samuel Chapman; his mother, Grace (Greenfield) Chapman; his brother, William Chapman; and his two sisters, Ella Constandy and Mildred Kinney. He is survived by his only daughter, Patricia (Chapman) Isaacson; his two brothers, Harold and Thomas Chapman; and his four sisters, Helen Eshleman, Ruth Brooks, Mary Schutt and Virginia Pielke. He also has several grandchildren, great grandchildren, nieces and nephews.